Histone acetylation/deacetylation alters chromosome structure and affects transcription factor access to DNA. Histone deacetylase (HDAC) and histone acetyltransferase (HAT) are enzymes that regulate transcription by selectively deacetylating or acetylating the (-amino groups of lysines located near the amino termini of core histone proteins. At least 4 classes of HDAC were identified. HDAC3 is a class I HDAC. HDAC3 has histone deacetylase activity and may participate in the regulation of transcription through its binding with the zinc-finger transcription factor YY1. HDAC3 can also down-regulate p53 function and thus modulate cell growth and apoptosis. The gene encoding HDAC3 is regarded as a potential tumor suppressor gene. This antibody is a rabbit polyclonal antibody raised against a peptide mapping within human HDAC3. 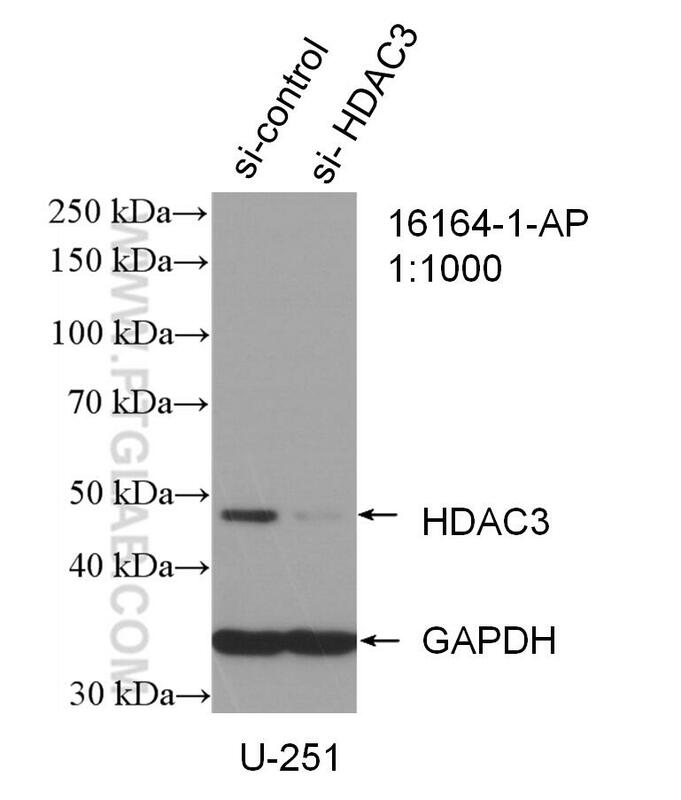 This antibody is specific to HDAC3, and will not cross react with other HDACs.